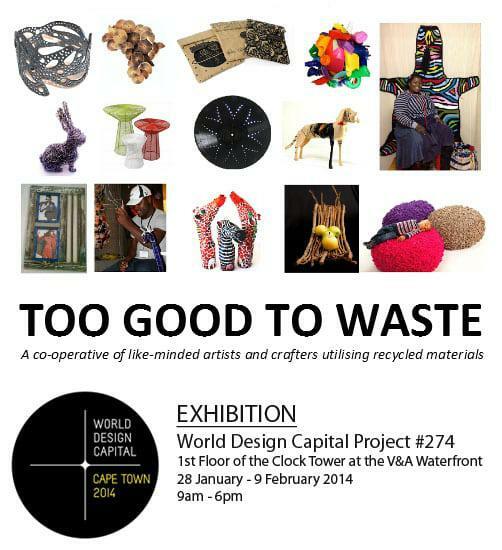 Too Good To Waste, a co-operative group that we are part of, was selected as a World Design Capital 2014 project (view all the projects here) and our first event is an exhibition at the Clocktower Shopping center at the V&A Waterfront for the next two weeks. Although our products will be on display inside the center our products will be sold at the KIN shop in the Alfred Mall (which is only a short distance away). This entry was posted in Blog and tagged #274, 2014, Clock Tower, exhibitions, Shopping center exhibitions, Sustainable exhibition, TGTW, too good to waste, V&A waterfront, WDC2014.